At Avante we design, print and build Custom Point of Purchase Displays in house. We keep your costs down and provide you with peace of mind by ensuring that your designer and your manufacturer are working side by side, creating solutions to help you sell more products. 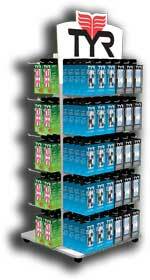 Point of Purchase Displays can provide a 28% boost in sales. Avante is one of the most comprehensive sources for economical custom displays. You can count on us to supply you with effective and affordable solutions. Make a note of how many different products you want your display to accommodate and the dimensions of each. Email or fax a rough sketch of your ideas. We will assist and guide you on any limitations that may arise. Our design group will contact you to offer suggestions and pricing options for the production of your custom display. Once a preliminary design is in place we will provide you with a 3-D rendering. Your ideas are quickly turned into reality. We manufacture a prototype of the design within 2-3 weeks, which gives you the opportunity to review our workmanship first hand. Call 1-800-407-8655, request a custom quote or download our catalog.